POUGHKEEPSIE, N.Y. — Marist College has launched the Center for Social Media within its Communication and Arts program. It is a multidimensional educational experience that provides new opportunities for students. The Center for Social Media offers workshops, speakers, and technology that are open to the student body. It commenced on September 25 with Marist alumna, and former Assistant Press Secretary to First Lady Michelle Obama, Kelsey Donohue. She gave the inaugural presentation about her role with the First Lady’s Snapchat account and how she implemented her digital strategy. She worked on the First Lady’s communication team and was extensively involved with the Let Girls Learn campaign. Senior Professional Lecturer of Public Relations, and Director of the Center for Social Media, Jennie Donohue, spoke in detail about some of the early challenges and goals within the center. “We’re currently going through various applications for student advisory committee and ambassador program,” Donohue said. She noted that candidates would be notified of their acceptance as ambassadors within the next week or two. They were, at the time, not released to the public and could not be questioned. These candidates applied after receiving an email from Dr. Lyn Lepre, Dean of the School of Communication and the Arts, calling for prospective ambassadors of the program. The program has been received positively by the Marist community. Juniors Mike Minardi and John Vaccaro are Communications majors and have involvements with social media. 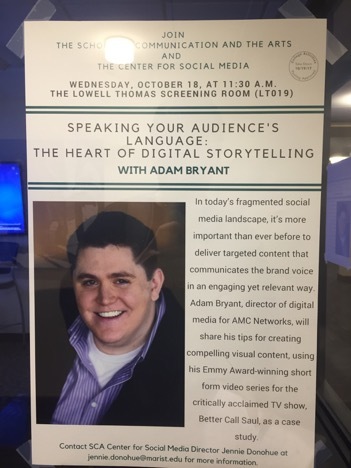 “I am interested in the Center for Social Media. “Social media is crucial for college students because it is a medium we grew up with,” said Minardi, of Montville, New Jersey. Minardi, a journalism major, also noted that he would be interested in taking some of the social media electives that are offered at Marist. John Vaccaro noted some of the more overlooked aspects of social media regarding building a brand and sharing work. “Some different ways social media is used is using Instagram in photojournalism classes,” Vaccaro said. The Center for Social Media at Marist, according to Professor Jennie Donohue, has received a strong, positive response from students. She is excited about the growing popularity of the center. “Our goal is to get students involved. Between the two sessions we’ve had 100 plus people attend,” she noted. While talking to Marist students, the most surprising point about the Center for Social Media is the tools within the program. 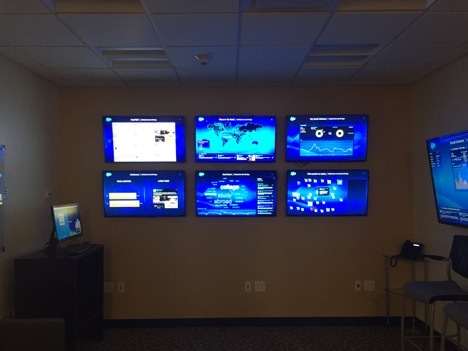 The center has 7 screens that can analyses hundreds of millions of conversations in real time. It not only focuses in on the topic, but can even analyze sentiment, both positively and neutrally. Professor Donohue noted that the center was running a generic case study on studying abroad. The technology can analyze and study in ways that most colleges cannot. When questioned about the importance of the Center for Social Media, Donohue noted the impact of her conversations with industry professionals in the field. Donohue, along with Marist, want to help fix the program and create more qualified candidates. She believes this program can help students in ways that will ultimately help in their professional goals.